Every dog is unique. Some breeds of dogs have traits that are centuries old, which still appeal to people to this day. The Labrador retriever, for example, has been ranked the most popular dog breed for the last 26 years. Today, the AKC recognizes 190 breeds of dog. But what about all the dogs who can’t easily be categorized as just one breed? Mixed breed dogs, often referred to as "mutts," are dogs who have genes from more than one type of purebred dog. They are commonly found in shelters—unfortunately, mixed breed dogs make up a large portion of abandoned and unwanted pets. Some people may be surprised to know that mixed breed dogs have benefits that many purebreds do not. Some argue that mixed breed dogs are healthier than purebreds. Since purebreds are bred for appearance, those standards generally take priority over breeding for health. That sometimes leads to specific health problems for certain breeds. Whatever your preference, there is no denying the positives a mixed breed dog can bring into your life. See some incredible examples of mutts we love below. Echo and his dog dad love hiking in their home state of Washington. Since Echo was adopted from a shelter, it’s not clear what his exact lineage is. His owner thinks he has some chihuahua and collie mixed in. Whatever he is, he's handsome–no guessing games there. Mixed breed dogs come in all shapes and sizes. Ollie is a small yet spunky Jack Russell terrier/mini poodle mix. He’s a big fan of toys—you can tell he likes his toy bin the same way he likes his food dish: full. Lilly is an adorable Pekingese/terrier mix. She has an equally adorable family—a dog sister and a cat brother. They even have a Youtube channel. Kota is an uncommon type of mixed breed dog. She is what some refer to as a low content "wolf dog" with some German shepherd and husky mixed in. Wolf dogs are very challenging to keep as pets and are not recommended unless you have the right resources and experience. Here's an example of how beautiful shepherd/husky mix combinations can be. Lots of people have soft spots for these big, fluffy dogs. While these mixes often include the best physical features of both breeds, they can also be a handful—they are a blend of two intelligent and energetic dogs. Some people have dubbed this combination the "gerberian shepsky." The adorable pup on the left with the oversized ears is another example of a German shepherd/husky mix. How can anyone resist such a cute furball? Spike is an American pit bull terrier mix who was adopted with the help of Flower Power, a photo project bringing awareness to shelter dogs. Sophie Gamand, the photographer, is an award-winning artist and animal advocate living and working in New York City. She often creates beautiful headpieces for the dogs as a creative way to highlight their beauty and personality. Is there anything cuter than a corgi? The answer is yes: a pitbull/corgi mix. Actually, every kind of corgi is unbearably cute. There is no possible way to declare one the best. Something about that adorable body shape paired with characteristics of other breeds (in this case, a chow) is what makes this particular mix so unique. One more for good measure. Because who would say no to a corgi/pomeranian mix? Also, just look at that face. Hound mixes are a common mixed breed dog found in the U.S. Since hound dogs were the first hunting dogs, today they consist of a wide variety of breeds. (Think coonhound, beagle, greyhound, deerhound). Hundreds of years of interbreeding hounds of differing sizes, weights, and temperaments have produced an umbrella "hound mix" classification. Neptune, a dashing hound mix, is an American rescue dog living his best life in London. Max and Maeby are two adventure-loving mixed breed dogs enjoying life in Tulsa, Oklahoma. Max is a mix between the husky and malamute breeds while Maeby is an unidentified mix. Can you tell which is which? Charlotte is a rescue dog from Puerto Rico. Her human parents are not entirely sure what kind of mix she is. Regardless of whatever genes Charlotte has, she is living it up in New Jersey in style–she's rocking that cool handcrafted dog bandana. Labrador mixes are another common mixed breed dog found in the U.S. Duke, a black Labrador Retriever mix, was previously waiting for his forever home at North Shore Animal League America, a no-kill animal shelter in New York. He has since been adopted, living a cozy and happy life on Long Island. Another Ollie, this time a lab mix, is a stunning canine living in North Carolina. Mellow, a yellow lab mix, lives in Tennessee. The semi-pricked or buttoned shape ears some lab mixes have is crazy adorable. 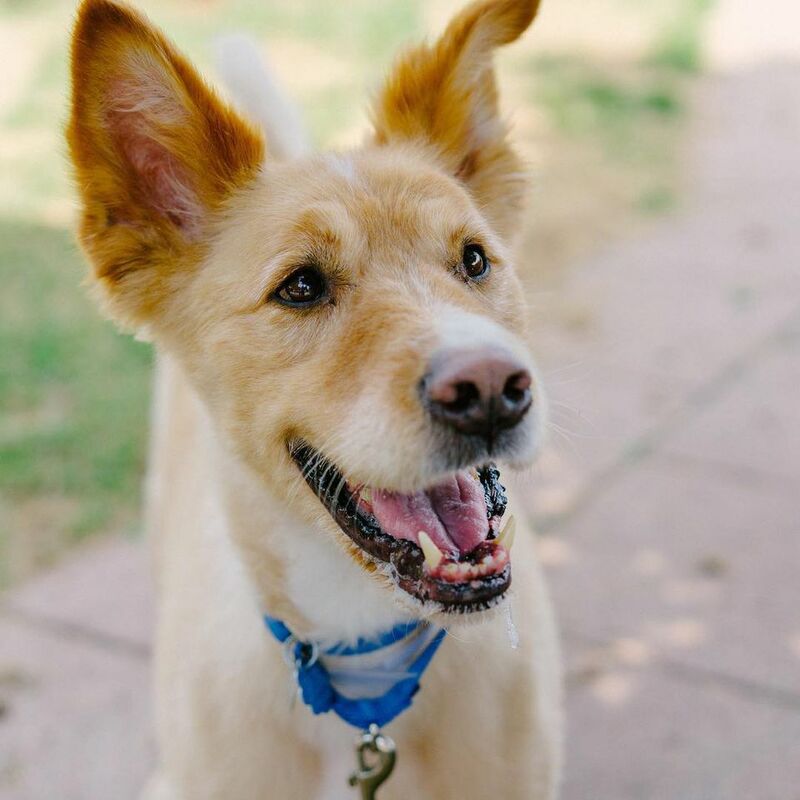 Abby is a mixed breed terrier pup sporting those non-committal ears we can't resist. Animal shelters all over the country are home to many types of animals, including mixed breed dogs and puppies. If you’re ready for a dog, consider visiting your local shelter. You might just meet your new best friend!